Sometimes a fight is a necessary evil. Sometimes there is no other way than war. You can turn a cheek and feel good, but can you still feel good when all about you are being persecuted for what they believe in or their way of life? You can also turn a blind eye, but that's the beginning of the end of the civilised world right there. Nobody really wants to fight. We'd all much rather get back to eating pizza, watching football or playing with our kids. But when the fight is right there in your face, and you've tried all reasonable alternatives? When backing down means people get hurt or die just because they believe in something different? It's the worst situation to be in, but you can't just make that go away by pretending it doesn't exist. You have to make that tough choice - do you fight or crumble. Badges Of War - Should Tattoos Be For Life? Tattoos have been a part of military life as far back as Roman times, through to Union and Confederate soldiers in the 1800's getting inked to demonstrate which side they were on. But it was really the US Navy in the 1900's where tattoos really started to become a popular piece of military life. It said something very clearly about who you were. Which is a trend that has only grown with the modern day ranks. Today, you'd be hard pressed to find many serving members of the forces without any tattoos - somewhere above 90% have at least one. Never make the mistake of thinking these are just casual, or drunken ink jobs. Military tatts mean a lot to those who wear them - they are chosen for a reason. They often say a lot about what that soldier has lived through - it could be as subtle as revealing their unit, or what campaigns they were involved in. It could simply be about pride of service or patriotism. They could just as likely be in memorium of fallen colleagues. 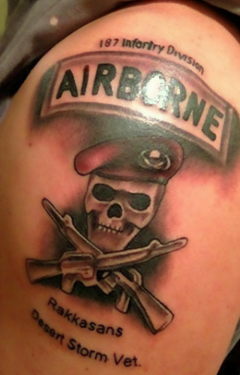 Never disrespect a servicemans ink because it might mean a hell of a lot more than you could ever know. These are badges of war, respect, service, rememberance and pride in ones self and country. They will never be removed. The difference between this kind of tattoo and the more cosmetic tattooing that has become commonplace in the general population could not be more different. Something that has only increased dramatically with trends set by celebrities, as well as the ability to remove tattoos more easily. Laser tattoo removal has become very effective and modestly priced - so what used to be a permanent life choice has now become something that can be removed if you change your mind. In a way that's a shame, because it means a lot more meaningless tattoos are being inked every day. When a tattoo is there for life you tend to make sure it really means something to you. At least you know that when you see military ink, those will always mean something - both to the person wearing it and those who recognise the meaning of it too. For those thinking of getting a tattoo, or if you know people who are, remind that of the origins of tattooing and the meanings behind it. I'd never tell someone not to get one, but I'd certainly recommend they at least make a choice that really means something to them, and will continue to do so. If there's no real meaning there you might just as well buy a new t-shirt instead.